It would be hard to argue these days that the sun isn't rising. The world outside has been transformed half a dozen times since the start of the month, and is now so bright that I had to shield my eyes when I walked out of the station yesterday. It's surprising how much closer together everything seems to be in the light of day. Well, the light of pre-dawn. The walk to DSL seems to have shrunk by a factor of two or more, and everything seems suddenly more closely connected: the station is never more than a quick hike down the road, the berms are all neatly laid out just behind it, SPT is only a couple of minutes from my door. We've got our big Sunrise Dinner this Friday, but the atmosphere is completely different from either that at Sunset or Midwinter's dinner. Despite everything I've been writing and the photos I've been taking, sunrise has somehow managed to sneak up on me. While I was excited and waiting with bated breath for both Sunset and Midwinter, I'm suddenly realizing only a couple of days out that Sunrise is about to happen. After all those months of darkness, deep down I don't seem to believe the sun is returning. To be perfectly honest, I might just prefer that it didn't. I'm done with the dark, but the light outside now is soft and brilliantly colored, much nicer than the harsh whiteness of direct sunlight. We've been experiencing the world's longest sunrise for the past three weeks, and it really has been beautiful - I'll be sad to see it go. 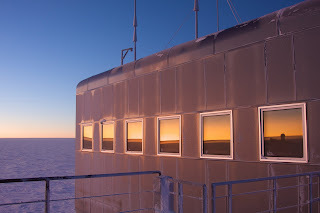 Some people on station are already talking about wintering again, simply to relive the sunrise. That's a little further than I'd go, but the last couple of weeks really have been a visual delight. 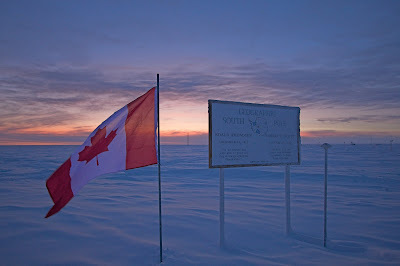 Two nights ago I found a Canadian flag nicely planted next to the geographic pole. I've no idea who put it there - or why - but there was some spectacular color behind it that I decided I couldn't miss. I bundled up and ran outside in the middle of the night to explore, and simply enjoy the view. This really is a wondrous place to live and work, and the little miracles like flags from home popping up one night in the middle of a three-week sunrise do a fair job driving that point home.